LGBT ski weeks attract ski and snowboard enthusiasts every year. But what is really happening there? A visit to the Gay Snow Happening in Sölden. It’s like a scene from a cliché gay movie: there is a lonely hut in the mountains, a coach drives up and releases a busload of sissies. It’s getting lively in the joint right away. DJ James puts on “Viva Colonia”, “Moscow” and “Breathless”, beer and champagne flow. Everyone sings along, dances on the benches first, but soon on the tables and finally tear off their t-shirts. In the Hühnersteign hut at the Gay Snow Happening in Sölden this is exactly not an imagined scene but pure reality. With its 13,000 beds Sölden is known as the “Majorca of the Alps” not only for its extensive network of slopes but also for its extensive nightlife with a distinct Ballermann-like atmosphere. And that means above all: heterosexual guests. Although a few rainbow flags bravely decorate the village high street during the Snow Happening, the few gay winter sports enthusiasts disappear in the mass of heterosexual guests. The conclusion for a strategy in a fun competition: Outnumber the others. Every day on the slopes at the meeting point on the Giggijoch, marked by a rainbow flag. And every evening at après-ski and parties in selected bars, huts and discos. The opening of the Snow Happening takes places at Club Philipp which can be reached by a cogwheel railway. The Berlin drag queens Mataina Ah Wie Süß and Melli Magic take a critical peek at the arriving guests and later lead them through the evening. The two quick-witted ladies have been involved in snow happening for years, responsible for jucy entertainment and the snappy presentation of the karaoke evening in the Partystadl. Gay Snow Happening: Hooking up with your skiing instructor? Another highlight is the visit to the Gaislachkogl mountain station. A lift takes you to the Ice Q restaurant, a modern glass and steel building known from the James Bond movie “Spectre”. With a breathtaking Alpine panorama in the background, the Snow Happening invites you to a wine tasting. The “Pino 3000” matured here at an altitude of over 3,000 metres. The guests of the ski week like it. And the local gays? Barely visible. 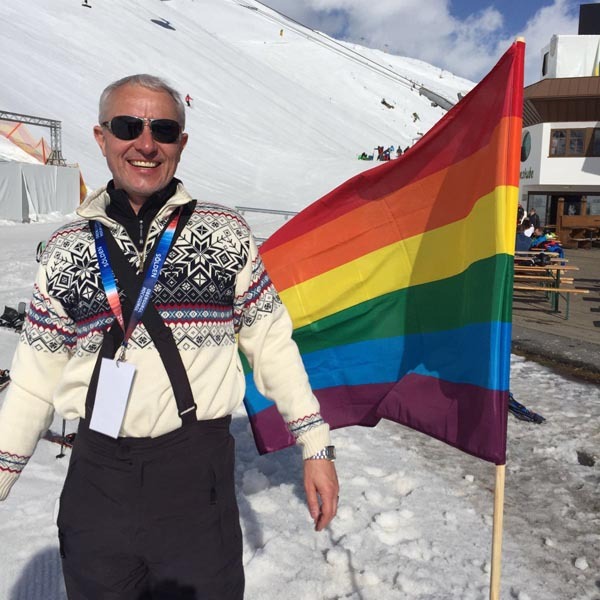 There are some confirms Gay Snow Happening ski instructor Ferdi. But sexual orientation doesn’t matter on the slopes explains the well-trained nature boy. And later at the après-ski? There’s the ski instructor cliché that they don’t miss out on hanky-panky. Ferdi makes clear that such behaviour is frowned upon. Never make advances as a ski instructor, only ever as a private person. He winks but unfortunately he doesn’t want to come to Marco’s for après-ski either. Here visitors linger about among the patio heaters, basses hum and the heterosexual guests gawk at the squeaking and bubbly-drinking men. Everybody’s chatting with everybody but there’s not much time. Because the shuttle bus is waiting: off to the Hühnersteign for another party evening.